I have to admit, I've never understood the appeal of cranberry sauce. I didn't grow up eating sweet dressings and sauces, so I didn't have a taste for it. 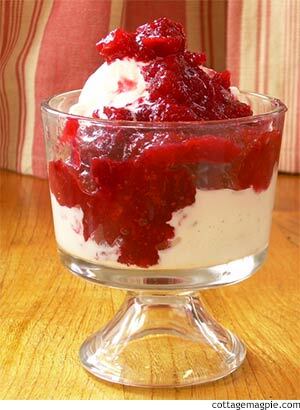 Plus, the only cranberry sauce we ever had as a kid was that gelatinous stuff that comes out of a can. Definitely not something that I ever thought looked appealing. So as an adult I wasn't too motivated to try any of it, either! But Mr. Magpie asked for cranberry sauce, so I went looking for something to make fresh. Oh friends, I had no idea!! This cranberry sauce is so good. So very, very good. I eat it straight. I eat it on ice cream. I eat it on toast. I can't stop. It's based on a recipe I saw last year on the BBC Food. The recipe is no longer on the site, so I had to wing it a bit, but it's pretty close. It's incredibly delicious. Plus it's a nice excuse to buy a bottle of Port. 1. Remove zest from oranges, set aside. 2. In a medium saucepan place the sugar and 1/4 cup of the Port. Squeeze the juice from the 2 oranges into the pan. Place on low heat and stir until sugar is dissolved. 3. Add cranberries, apple and orange zest. Cook over medium heat, stirring occassionally, 10-20 minutes or until soft and thick. 4. Remove from heat. Stir in remaining 1 T Port. For fun, give each person (or every two people) a small serving in a vintage glass punch cup with just enough sauce for one or two. It'll save on passing dishes and add cottage charm to your table. And don't forget to eat the leftovers over ice cream.